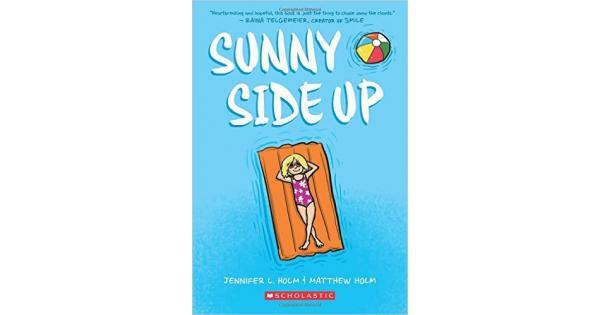 Sunny Side Up is a realistic fiction graphic novel by Jennifer and Matthew Holm. The book is about having a loved one with alcohol and drug abuse problems. An average 10-year-old girl named Sunny is living a normal life and looking forward to the family summer vacation that is coming up soon. But suddenly, their plans change. Sunny had to go to Florida alone to visit her grandfather for the second half of the summer. But why? Sunny Side Up takes an emotional and dramatic look at when someone keeps dangerous secrets and how it affects the person they entrust them with. Sunny’s older brother Dale has alcohol and drug abuse problems, but Sunny is too young, and does not understand. She has many questions. Why has Dale been acting the way he has? Why did the family change their plans? Why is she in Florida, alone? All throughout the book, Sunny has flashbacks to her life in Pennsylvania. Almost all of them show that Dale has problems. In an early flashback, she remembers her first day of school. Her teacher takes attendance, and when she calls Sunny’s name, the teacher asks if she is related to Dale, since they have the same last name. Sunny says yes, and the teacher frowns when she tells her that she had taught him when he was in the 11th grade. Her teacher’s frown makes her feel miserable. She doesn’t understand exactly why, but she knows that there is something wrong. In a second flashback, her mother tells her that it is time for dinner, and to go and find Dale. Walking around town, she stops by a small bridge, and smells smoke. She sees that the smoke is coming up from under the bridge, so she goes to look. She sees her brother and two of his friends. Dale is holding a lighter up near his face. In the light of the flame, she can see that he has bags under his eyes. Her eyes and mouth open wide in surprise and shock. As they are walking home, he asks Sunny, “You didn’t see anything, did you, Sunny?” She swallows hard, and says, “No, I didn’t see a thing,” but she again looks miserable, and walks home with slumped shoulders. Sunny feels guilty because she is keeping his secret from their parents, but she does it because she doesn’t want him to get in trouble. She loves him, but when you love someone, you’re supposed to keep them safe. On the inside, she feels torn apart, like a tug of war, pulled by both sides – her love for her brother and her worry about his safety. She is afraid for him, but she doesn’t know what to do. In a final flashback, Dale punches Sunny on the 4th of July, just before she is sent to Florida. The family is at a park watching the fireworks, all happy. Then Dale shows up, carrying a can of beer, acting like he is drunk. His dad tries to grab the beer from him, and Dale gets super mad. He makes like he is going to punch his father, but Sunny gets in the way to try to stop him. He ends up punching her instead. She falls to the ground, her eyes tearing up. She cannot move; she is paralyzed by horror and fear. Perhaps she finally realizes that there is something seriously wrong with her brother, but she has been keeping his secret; maybe this is partially her fault? Did she bring this upon herself? Should she have said something or done something? This is the last time that she sees her brother before the family plans change, and she ends up in Florida without him, and without her parents. What has happened to Dale? At her grandfather’s house in Florida, Sunny finds a pack of cigarettes hidden in the bathroom. Sunny starts finding packs of cigarettes all around her grandfather’s home. He had told her that he had quit smoking, but she begins to have second thoughts. Is someone else in her family trying to hide secrets from her? Can she trust anyone in her family? This book is very dramatic and the emotions Sunny feels for Dale and her grandfather are strong. She worries for both of them. She’s having a hard time understanding what’s going on. I thought this was a very emotional book, and while it is a graphic novel, I would recommend it for people aged 11-15, or anyone who has a loved one who is like Dale. Even though this graphic novel is loaded with pictures, and is easy to read, younger kids won’t understand the concept of the book. Daddy's afterthoughts: I picked this up for Julia when she was 9 (maybe 10) at a Scholastic Book Fair, but held onto it for a year or so before I gave it to her. It deals very bluntly and emotionally with the downward spiral of addiction and how it can affect a family. It is a very important conversation to have, and a very well done book (I'm normally not a fan of the "graphic novel as literature") but parents of kinds under 10 or 11 might want to screen the book first, because it will trigger family conversations. Common Sense Reviews gives it top marks for Educational Value, Positive Messages, and Positive Role Models, but still, preview the book before passing in on to your young ones.